Lightsheer Diode Laser · Lumenis Delhi represents a revolution in hair removal by disabling hundreds of hair follicles in seconds and by promising long lasting results. Mortifying waxing experiences. Goopy at-home creams. Last-minute bikini season shaving. When it comes to removing unwanted body hair, you’ve put yourself through the ringer. But with Empathy's Light Sheer Lightsheer Diode Laser · Lumenis treatment, you’ll say goodbye to everyday shaving – and get used to skin that’s smooth and stubble-free. At Empathy Laser Hair Removal Clinic, we have performed several Lightsheer Diode Laser · Lumenis delhi treatments. Quite simply, we know what works – and we’re leaders in our field. Our team ensures that our methods and training programs exceed industry standards, and we’re constantly evolving to meet our clients’ needs. So you can be confident that you’re getting the safest, most effective treatment at the best possible value. How does Lightsheer Diode Laser · Lumenis work? Our Light Sheer Lightsheer Diode Laser · Lumenis system uses a combination of energy and heat to destroy follicles without harming the skin around them. After a series of sessions, you’ll experience permanent hair reduction. Depending which area(s) you decide to treat, you’ll always be ready to slip into a swimsuit, won’t have to think about razor burn or irritation, and will stop worrying about unsightly ingrown hairs. How long does Lightsheer Diode Laser · Lumenis take? You have millions of hair follicles in your body, all of which cycle through different phases. Laser hair removal can only treat a certain percentage of those follicles at a time (those that are in the active phase), so it must be done at varied intervals. Because no two bodies are the same, your treatment plan will be tailored specifically to you, but we typically recommend at least eight to ten Lightsheer Diode Laser · Lumenis sessions. With Lightsheer Diode Laser · Lumenis, nobody will know you’re undergoing treatment (unless, of course, you want them to). Lightsheer Diode Laser · Lumenis sessions can be as short as fifteen minutes, and we just ask that you stay out of the sun, shave the area to be treated; and avoid using lotions, creams or products, for optimum results. What does Lightsheer Diode Laser · Lumenis feel like? Who qualifies for Lightsheer Diode Laser · Lumenis? We customize your Lightsheer Diode Laser · Lumenis treatment to match your hair color, skin color and type. Combination of Nd:Yag & Diode Lasers, lasers from America and US : FDA approved for Indian skin type. Lightsheer Diode Laser · Lumenis is a non invasive procedure, by which unwanted hair are removed from any part of the body by utilizing a long pulsed laser. Lightsheer Diode Laser · Lumenis is performed by a specially - trained laser technician or a doctor, who directs the light of a long pulsed laser onto the skin. Since other hair will enter their growth cycle at different times, several sessions are necessary to destroy all the follicles in a treatment area. Both men and women seek Lightsheer Diode Laser · Lumenis to get unwanted hair removed. Hair removal is commonly done on the hairline, eyebrow, top of the nose, side burn, upper & lower lip, chin, ear lobe, face, neck, nape, shoulders, back,, underarm, abdomen, buttocks, public area, bikini lines, thighs, breast, arms, legs, hands, and toes. • Is Lightsheer Diode Laser · Lumenis Safe? Is Lightsheer Diode Laser · Lumenis Safe? For safety, Lightsheer Diode Laser · Lumenis is not recommended when pregnant. We offer our clients a more efficient topical anesthetic that we apply for you in the salon in which case you need to come in 20 minutes earlier. That service is a choice we offer and is not included in the Lightsheer Diode Laser · Lumenis cost. Avoid hot baths, hot tubs and working out for 24 hours after Lightsheer Diode Laser · Lumenis. The area to be treated should be shaved one day prior to treatment as closely as possible so the laser can target the energy towards the hair follicle. If you fail to shave beforehand we will likely shave the areas at the time of the appointment. On the day of treatment no lotion, makeup, perfume and deodorant should be used on the areas to be treated. After treatment, you may experience brief swelling and redness which subsides within a day. Avoid scratching the treated area and use sun screen. Within 1-3 weeks, you should experience shedding of hair in the treated area. At first, it will feel like the hair is growing back in, but these are the hairs coming through the skin to shed. After shedding finishes, you might experience little black hair dots stuck in the skin which will eventually shed, but may take a bit longer. Exfoliating and/or scrubbing gently in the shower with a cleanser or a loofah can help speed up the process of the hairs falling out. Pain varies between individuals. Some parts of the body tend to be more sensitive than others depending on the thickness and density of the hair, skin type, and one's ability to tolerate or feel pain. Most people experience no more than a slight stinging sensation as the laser pulses are applied. Generally, the hair in the area being treated becomes thinner and less dense after each treatment, therefore less discomfort is experienced. Most people need at least 6-12 initial treatments spaced 4-6 weeks apart. Depending on hair type and genetic factors, some individuals may require additional treatments beyond these initial treatments. Some causes of excessive hair growth can be caused by hormonal imbalances, reactions to certain medications, normal aging processes, heredity, and excessive temporary removal methods like waxing, tweezing, creams and depilatories. Everyone is unique and will react differently to the laser. It is important to know the three main phases of the hair growth cycle in order to understand why several treatments are required. 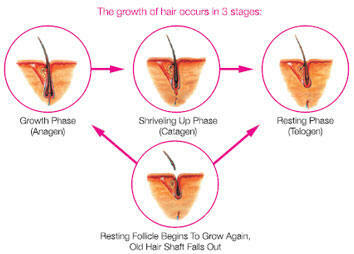 The Anagen phase, also known as the growing phase, is the active growth phase of hair follicles. It is the phase during which laser hair removal treatment is most effective. During Anagen phase, the hair follicle is directly connected to the blood vessels and the hair bulb produces your hair pigment. The laser targets the melanin of the hair and cuts off the blood supply to hairs resulting in no more hair growth. The Catagen phase, also known as the transitional phase, is when hair follicles control the hair strand and hair growth stops. The hair is not visible and capable of absorbing the laser light and therefore its difficult for permanence to be achieved. 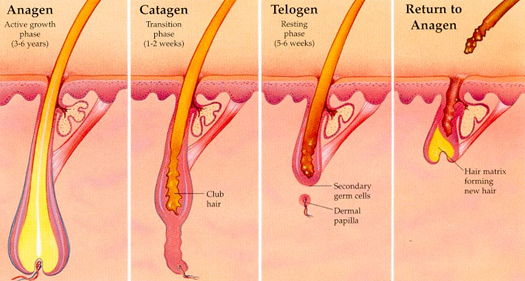 The Telogen phase, also known as the resting phase, is when hair detaches from the blood supply and it is preparing to fall out. The hair bulb stops producing the color pigment. The hair is not visible and capable of absorbing the laser light and therefore cannot be destroyed. Our hair is in Anagen phase only 1/3 of the time. 3/4 of the time it is in Telogen and Catagen phase. 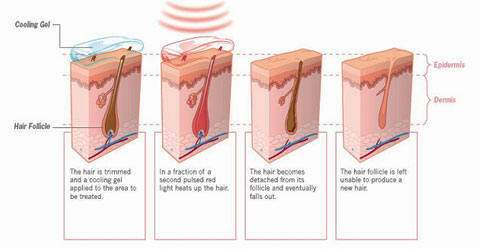 This is the reason why several treatments are required to catch all of the hairs when they are in anagen phase. During pregnancy, women often experience an increase in hair growth due to hormonal changes that the body goes through. The body becomes more sensitive and those who find the treatment painful may stimulate stress on the body which is not good for the fetus. Although there is no proof that laser hair removal treatments are dangerous during pregnancy, it is best to avoid treatments until after bearing a child. Laser Hair Removal is the best way to eliminate unwanted hair and a permanent solution. It is effective and painless, making it a more popular method of hair removal for those who are not interested in shaving and waxing over and over again for the rest of their lives. Laser hair removal is much more affordable than it used to be and more cost and time efficient in the long run in comparison to waxing, shaving or depilatory creams. Traditional methods of hair removal include waxing, shaving, tweezing and depilatory creams which are all temporary and need to be repeated frequently over a lifetime. Shaving is a popular option as it is a fairly inexpensive hair removal method; however it can results in ingrown hairs, irritations and cuts. Shaving has to be done on almost a daily basis for skin to stay smooth and hair free. Waxing pulls hair out by the roots but does not destroy the hair base, so the hair grows back. Waxing can be painful and must be repeated every few weeks. Tweezing is only ideal for small areas such as eyebrows; it can be rather time consuming to pull each individual hair out one by one. Depilatory Creams are full of harsh chemicals that burn out the hair and can cause skin irritation or a chemical burn. The Lumenis LightSheer Duet is the latest breakthrough technology for hair removal and has been clinically proven as the best treatment for all skin types and colours. In the medical world, it is recognized as the GOLD standard for permanent hair reduction. Laser hair removal is a non-invasive office procedure for a permanent reduction of facial and body hair. This procedure does not require any anaesthesia. The LightSheer Duet will effectively treat all hair types and complexion ranges including tanned and fair skin. The laser is so precise in targeting hair, that you can have hair removed from all parts of the body with minimal discomfort and treatment time. Proven reliability and outstanding "up time" track record ensures that patient treatments can proceed on schedule. Compact and lightweight design allows portability between offices or movement between rooms within the same office. Leg Veins -b>Leg Veins - Approximately 50% to 60% of men and women have unsightly leg veins. While sclerotherapy is still considered the treatment of choice for the removal of superficial leg veins, many vessels may be too small to inject or patients may have an aversion to this invasive procedure. The LightSheer diode laser system can provide an alternative method of treatment that requires no painful injections. Pseudofolliculitis Barba PFB, or razor bumps, is a common condition in which the regrowing hair, after shaving, curves back towards and pierces the skin resulting in a pustule or papule. PFB is very prevalent in populations with curly hair, affecting nearly 85% of men of African decent and a growing number of women. The LightSheer's excellent safety profile for all skin types including the darkest skin, makes it a safe, effective and revolutionary alternative for the treatment of pseudofolliculitis barbae. Physicians desiring more information about LightSheer laser treatment of PFB can request a copy of Pseudofolliculitis Barbae A Treatment Module: Etiology, Medical and Laser Therapies authored by Fran E. Cook-Bolden, M.D. Ethnic Skin Specialty Group, New York, New York by filling out our Contact Us form. In the last decade, many lasers and phototherapies have been introduced for the same purpose. However, Duet is way ahead of all the other modalities of permanent hair removal available as it is the….s it is the…. Benign Pigmented Lesions � The LightSheer diode laser system can successfully treat a wide range of cosmetically undesirable benign pigmented lesions. Pseudofolliculitis Barbae (PFB) � PFB, or razor bumps, is a common condition in which the regrowing hair, after shaving, curves back towards and pierces the skin resulting in a pustule or papule. PFB is very prevalent in populations with curly hair, affecting nearly 85% of men of African decent and a growing number of women. The LightSheer�s excellent safety profile for all skin types including the darkest skin, makes it a safe, effective and revolutionary alternative for the treatment of pseudofolliculitis barbae. Physicians desiring more information about LightSheer laser treatment of PFB can request a copy of Pseudofolliculitis Barbae A Treatment Module: Etiology, Medical and Laser Therapies authored by Fran E. Cook-Bolden, M.D. Ethnic Skin Specialty Group, New York, New York by filling out our Contact Us form. How long has The Laser Centre been doing laser hair removal procedures? The Laser Centre has been doing laser hair removal procedures since 2000. We were the pioneers of this technology in India. Using the state-of-the-art laser system, we have removed unwanted hair from thousands of satisfied men and women. We have performed more than 30,000 treatments. The laser works by a principle called Selective Photothermolysis. The laser is pulsed (turned on) for a millisecond emitting a gentle beam of light on to the skin. The light energy passes harmlessly through the skin, but is absorbed by the pigment in the hair follicle and hair shaft. By absorbing this laser energy, the hair follicles are disabled, impairing their ability to grow. The laser is effective on hair follicles in the active growth phase (anagen). How is the laser hair removal procedure performed? A hand piece is pressed against the skin during the treatment, which delivers and unhindered laser beam to the desired target area. The laser beam is absorbed by the root of the hair and the hair root is burned permanently without damaging the skin and surrounding tissues at all. The laser beam targets the pigment within the hair follicle, disabling the follicle. It is designed to selectively target the follicle without harming the surrounding skin. Is this procedure safe for everyone? Yes. The laser parameters were carefully defined to inhibit re-growth by studying the anatomy of the hair follicle and matching the laser light and pulse duration to the follicle size, depth, and location to safely and effectively remove hair. Visible results in hair reduction can be seen after 2-3 sessions. Satisfactory results are seen after 6-8 sessions. As all hair in a given body part does not grow at the same time, we have to remove them in stages. Lasers can only remove hair in the active stage. Why are follow-up sessions required? The laser effectively targets most of the hair follicles in the body. Hair growth pattern varies from individual to individual. But certain factors such as physiological changes in the body such as hormonal disturbances and imbalances, puberty, pregnancy, menopause, ovarian tumours, various medical conditions and medications can cause new hair growth. Certain conditions or disorders like polycystic ovaries (PCOS), obesity (which disrupts the hormonal balance) and thyroid conditions also cause excessive hair growth. 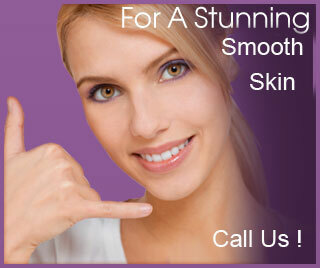 Laser hair removal should work for you, if you choose a qualified hair removal centre. Make sure that the centre has a medical doctor who supervises the parameters of the treatments. The treatment should be performed by a trained laser technician. If you are skin type 4 through 6, you may require some additional sessions to get desired results. At what age can the treatment be done? Ideal age for laser hair removal procedure is 14-15 years (females), 16-18 years (males). Yes it is extremely safe during pregnancy. As laser is only a light beam and it never goes deeper than the hair follicle. Are there any long term side effects? In the medical field, lasers have been used since 1960’s. Till date, no long term side effects have been reported. Our centre uses lasers since 1999 and till date not a single case of any undesired effect has been observed. Depending on the amount of hair and area treated, the procedure varies from patient to patient. Generally, the treatment will include: Safety eyewear to protect the patient's eyes during the procedure from the laser light. Most experience little discomfort at the treatment site. The sensation and the degree of discomfort varies with each person. In some cases, topical anesthesia is an option. Your physician will discuss this before laser treatment. Depending on the size or number of areas treated, the time will vary in length from minutes to a couple of hours. Patients can return to work or resume their normal activities immediately following treatment. The area may become slightly red and this may last from a few minutes to a day depending on the area and skin sensitivity. Around 3-10 days after the treatment, hair will begin to surface. Most of these hairs were treated and are “falling out”. This is NOT re-growth. The hair follicles need to purge the hairs that remained under the skin. How does laser hair removal differ from electrolysis and is the treatment permanent? The main difference between this technology and the traditional method known as electrolysis, is that lasers can treat multiple hair follicles at one time, no longer requiring the need to identify and probe each individual hair follicle, as done with electrolysis. 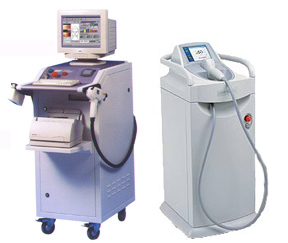 Laser hair removal is relatively new technology. The FDA, however, has recently provided clearance that indicates lasers can achieve a permanent reduction in hair growth based on clinical tests with patients who have hair reduction two years after treatment completion. Most people need an average of 6-8 treatments. Hair grows in cycles and subsequent treatments are necessary to treat the follicles that are lying dormant below the surface of the skin. These dormant follicles contain little pigment and are often not affected by the first treatment. Laser hair removal is the most practical, least painful, most efficient, and probably least expensive professional method available to remove unwanted hair. What are precautionary measures that need to be kept in mind before the treatment? Avoid direct sun exposure to the area that needs to be treated. Do not wax, thread, pluck or bleach the area before the treatment. Even now, with the most modern technology, myths stop people from getting the high quality laser hair removal treatment. The Laser Centre only used LightSheer Duet laser for all of its hair removal treatments. This is the gold standard for effective hair reduction in the medical world. This laser delivers a beam with pinpoint accuracy, targeting only the hair follicle and not the surrounding skin. With the new breakthrough technology of the LightSheer Duet, patients experience minimal discomfort. This pain is not more than waxing and is 1/5th of the pain as compared to other lasers! Think about how many fewer laser hair removal sessions you will need to be hair free compared to a life long of waxing and shaving! Laser hair removal is a procedure with permanent hair reduction up to 95%. There will be no more expenses on waxing, shaving, threading and electrolysis treatments. Overall, you will spend less for a laser treatment than you would have for a lifetime of temporary hair removal methods. Also, consider our Full Body Hair Removal packages as well as customized packages! The LightSheer Duet is the fastest and safest laser for hair removal. Other lasers can take up to 3 hours for legs treatment. Whereas we can do the same in ten minutes. On the face value, all cars look the same! But are they really?? You can not compare a Ferrari with any other car on the road. LightSheer Duet is a class by itself! It is used in the cosmetic world for the longest period of time and is approved by the medical world as the perfect balance between safety and efficacy. When you consider laser hair removal process as a permanent procedure, you will spend quite less overall, than you would have spent on repeated waxing, threading, and electrolysis treatments. No messy waxing, threading, shaving for life!!!! To find out if laser hair removal is for you, call today to schedule a free consultation and a complimentary patch test. The Visionary zeal of social service to help people improve their own self image prompted the Founder Director, DR. Rajnish Anand to launch AURA Skin & Laser Clinic.Dr.Anand has undergone Advanced training in Light Sheer Surgical Technology from California,USA.He is a member of the Royal European Society of Laser Surgery. He is also a member of American Society of Cosmetic Dentistry,Indian Dental Assiociation. Dr. Rajnish Anand was one of the first Doctors in India to introduce Light Sheer Diode Laser System. Choosing the Right Cosmetic Surgeon for your needs is a major decision.We offer Procedures that are safe and effective.Dr.Sunil Dhar offers various surgical procedures i.e.Scar Removal, Eyelid Surgery, Lip Augmentation, Breast Augementation, Breast Reduction, Male Breast Reduction, Abdominoplasty(Tummy Tuck). We at Aura offer our patients a warm, personal, Atmosphere, Comprehensive Care,and genuine commitment to your happiness. In case you are not happy with the shape, size or angle of your nose, ears, lips or cheeks - we can improve them through our surgical and non-surgical methods. Senior ENT surgeon of our team, Dr Avdesh Mehta can help you to get the desired improvement in your appearance.